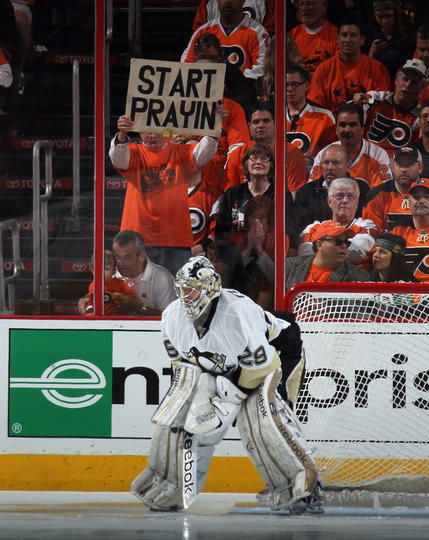 Coming into the first round of the Stanley Cup Playoffs, there was a league wide consensus that the series between the Pittsburgh Penguins and Philadelphia Flyers would be one of the best series that the opening round had to offer. Even with all the lead up, what has unfolded in the first three games could not have been seen by anyone. Through three games there has been 32 goals scored, over 150 penalty minutes, hat-tricks, Gordie Howe hat-tricks, fights, highlight reel goals and saves, insane comebacks, overtime wins and even a fight involving Sidney Crosby and Claude Giroux. However, despite all the chaos that has unfolded up to this point in the series, one thing has not made an appereance, consistent and solid goal-tending. The goalies were thought to be the deciding factor in this series. Media outlets continued to talk about who would steal this series for there team. But it has been quite the opposite, it has come to the point that who ever plays less of a sub-par game will have the best shot at a win. After three games played the Penguins' Marc-Andre Fleury has been scored on 17 times, has a 6.34 goals against average and sports a .798 save percentage, ouch. In the other crease Ilya Bryzgalov has let 12 shots past him, has 3.96 goals against average and a .868 save percentage. Not the numbers you want your number one goalies sporting during the playoffs. Don't get me wrong, there has been flashes of brilliance between the pipes for both teams. The thing is that those flashes are few and far a part and are overshadowed by several soft goals given up by each goaltender. Fleury was pulled after after two periods of play in game three, where he allowed six goals on 28 shots. Unlike Fluery, Bryzgalov has yet to be pulled. Both goaltenders have seemed unfocused and shaken up at times in this series. Since both goalies have looked shaky more than confident during this series, it may come down to who rebounds and finds their game first. For Fleury and the Penguins, that will have to be fast since they are one game away from being eliminated. SID "THE KID" IS JUST WHAT BURNSIDE TOLD THE HOCKEY WORLD. HE IS A PUNK. I HAD AT LEAST RESPECTED HIM AS A FLYERS FAN BUT, WHEN HE TOOK HIS STICK AND THREW JAKE V'S GLOVE ASIDE THAT WAS IT FOR ME. OH, AND FOR ALL THE PENS FANS HE IS THE THIRD BEST PLAYER TO PLAY IN PITTSBURG. ONE IS THE OWNER AND THE OTHER PLAYS FOR THE FLYERS. FLUERY SHOULD THINK ABOUT GOING BACK TO W/B SCRANTON(AHL)BUT THEY THOUGHT HE SUCKED TOO.